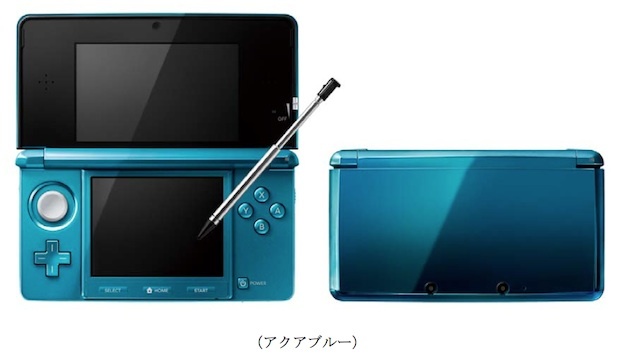 Home » Nintendo 3DS portable gaming console unveiled! The internet is literally flooded with news and information about Nintendo’s latest iteration of the DS portable console, the Nintendo 3DS. First things first. The Japanese release date for the Nintendo 3DS will be on February 26, 2011. The U.S./E.U. release date will be in March. Bundles with a charger stand, an AC adapter, a 10cm Nintendo 3DS touch pen, a 2GB SD card, six augmented reality cards. Include a slide pad, a motion sensor and a gyro-sensor. Play games downloaded off the 3DS’s Virtual Console or from game cartridges compatible with the Nintendo DS series. Nintendo 3DS is 134mm by 74mm. It is 21mm thick and weighs 230 grams. The top screen is 3.53 inches and with an liquid crystal display of 800 x 240 pixels. The button screen is 3.02 inches with a liquid crystal display of 320 x 240 pixels. It has two outer 0.3 megapixel cameras and one inside the portable’s clamshell. The 3DS supports Nintendo DS game cartridges. 3DS games are of the same specs size so will fit (but likely not work with) older Nintendo DS models. The 3DS has an SD card slot, an slot for the AC adaptor, mic and headphones jack. Nintendo has this video to highlight the features of the 3DS. They reiterate the stuff I’ve listed above but you can still view it for more information :). And the 3DS line up? Nintendo has an official microsite for the Nintendo 3DS right here.